Destinee Armstrong, Cheena Vohs and Lexis Heckman (left to right) are headed to the front of the class as GCU’s Rodel Promising Student Teachers. The College of Education seniors will be student-teaching at high-needs schools for 16 weeks. For as long as Cheena Vohs, Lexis Heckman and Destinee Armstrong can remember, working with children has been a lifelong ambition. Those dreams come true today. The GCU College of Education seniors walked into their respective classrooms in three Phoenix public schools on the first day of classes after the holiday break. They’ll spend the next 16 weeks teaching in those high-needs schools in which a majority of students qualify for free or reduced-cost school lunches. Vohs, Heckman and Armstrong recently were named Rodel Promising Student Teachers by the Rodel Charitable Foundation of Arizona, and are among 16 GCU students to have earned the honor. They will be mentored by Rodel Exemplary Teachers who are some of the finest in the business, said Dr. Marjaneh Gilpatrick, Executive Director of Educational Outreach in the College of Education. In addition to the mentorship, the women each will receive a $1,000 tuition waiver and, following their graduation, they’ll be given teaching positions in high-needs schools. Each will be rewarded with a $5,000 stipend from Rodel after completing their three-year assignments. Vohs, 21, is dividing this semester between Justine Spitalny School in the Cartwright School District, where she’s working with special education students in second through fourth grade, and Larkspur Elementary in the Paradise Valley School District, where she’ll teach fifth graders. Heckman, 20, is teaching in a third-grade English as a Second Language classroom at Bret R. Tarver Elementary, also in the Cartwright district. Armstrong, 22, is a sixth-grade math teacher at Granada East School in the Alhambra Elementary School District. 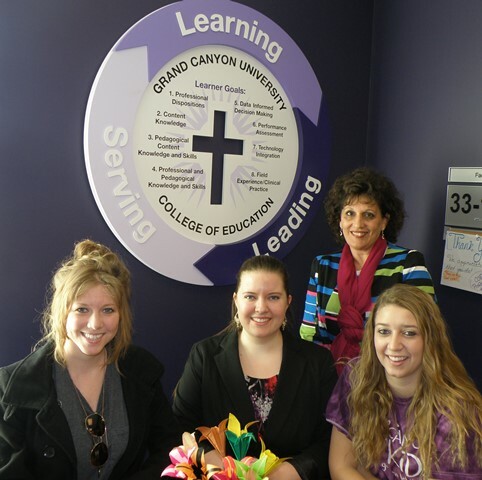 Dr. Marjaneh Gilpatrick, executive director of educational outreach in GCU’s College of Education (pictured second from right with the University’s three Rodel student teachers), says the Rodel program meshes with the college’s mission of learning, leading and serving. As a young girl growing up in Payson, Vohs played school with her friends and came to believe that teachers had “the coolest lives ever.” She started college at Northern Arizona University, but transferred to GCU her sophomore year after the University offered her a scholarship. 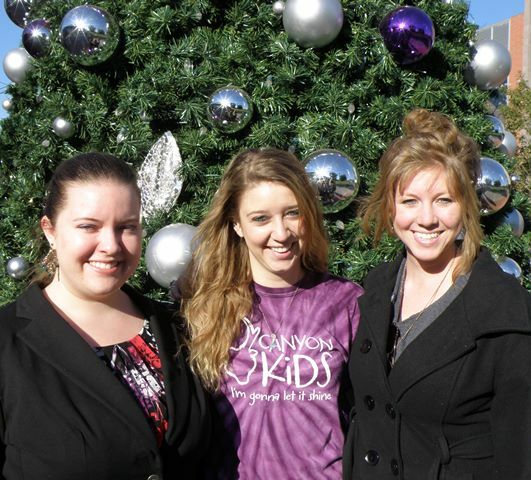 Vohs was instrumental in creating GCU’s Future Educators Association, and has been involved in myriad student volunteer opportunities with Canyon Kids, at Serrano Village and elsewhere. As a second grader, Heckman wrote an essay that she wanted to be a teacher when she grew up, mostly to win brownie points from her teacher. She now believes God was directing her future even then, and is looking forward to teaching English to students who don’t speak it as their first language. Armstrong, who grew up in Colorado Springs, initially wanted to be a nurse, but leadership experiences in church drew her to teaching. If she can teach children who may have little support or motivation at home, she believes she’ll be able to reach all types of students during her career. All three women say they are up for their respective assignments. Since the Rodel Exemplary Teacher Initiative was established in 2004, more than 500 student teachers have been trained in Maricopa, Pima and Coconino counties. Gilpatrick called the experience a “semester-long job interview” in which the students can demonstrate their value to students, parents, teachers and administrators. “Rather than relegate the child who doesn’t speak English or speaks limited English to just coloring and learning ABCs, they will be assessing these children and determining what each child can do, and how they can reach them and take them to the next level,” she said.